John B. Whitman : Hawaiian Journal, 1813-1815. 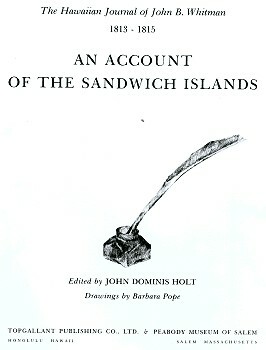 Edited by John Domonis Holt. Topgallant Publishing Company, Honolulu, Hawaii,1979. pages 52 to 55, 57 and 58, and 88. In the construction of their canoes they display an uncommon share of patience, industry and ingenuity. The peculiar fashion of the different parts admirably adapted to form a machine to glide swiftly through the water and the nicety with which these parts are put together manifests a degree of skill which surprises the more accomplished artisans of the civilized world. When we reflect upon the disadvantages under which they laboured before the introduction of iron, we cannot but admire the ingenuity which enabled them to construct such a vessel with no other tools than such as were made from shells and stones, and the skill and patience which could render such materials subservient to such important purposes. The making of a first rate canoe was formerly the work of two or three years. As the largest and most suitable trees are found in the interior of the Islands and frequently in the highest parts of the mountains it is necessary to reduce them to proper model and dig them out before they can be removed to the seashore. When the canoe is to be tarbooed to any particular purpose, offerings are made to propitiate the Etour, and if he is found by the result of certain mystical rites to be favourable to the appropriation of the tree, it is cut down and laid on logs to prevent it from warping. ... frequently remains for two or three months in the mountains busily employed fashioning and reducing it to the proper thickness. Their canoes are of various lengths adapted to the purposes of war, fishing and playing in the surf. The first are double canoes or two canoes securely fastened together by strong timbers lying across the tops and firmly lashed to each canoe. Some of these are sixty feet long and being made of the largest trees will carry from sixty to one hundred men. They have a quarter deck or platform with seats to accommodate the Chiefs and are generally provided with a large sail made of coarse mats of a triangular shape, the obtuse angle being at the top of the mast, the peak runs high and in the Kings canoe has a plume of long black feathers flying as a signal or penant. The form of the sail has been materially altered within a few years and is another instance of the improvements they are making under the tuition of the white man. They readily abandon the custom of their ancestors to adopt those that are demonstrably better, and have now substituted the square sprit sail, some of which are made of canvas. A canoe consists of several parts secured together by small line. The hull is made of one piece, the top which is made of a wood resembling boxwood is composed of four pieces so contrived as when put together to be about half an inch larger than the upper edge of the canoe. This is fastened to the canoe by means of firm braided line made of the fibres of the cocoa nut husk which is passed through small holes made in each part at intervals of one foot and so nicely wrought as not to be seen on the outside of the canoe. The ends of the top are put together in the same manner and are so nicely fitted that the joints are hardly to be perceived. This part is generally constructed by their most skillful workmen and will bear comparison with our best carpenter work. The single canoes are fitted with an outrigger consisting of what they call the eyacco and eyammer. The eyammer is made of a light buoyant wood and its form is such as is calculated to glide smoothly through the water. It is placed parallel to the canoe at about five feet distance and secured to it by the eyaccos which are two pieces of strong wood selected with great care for the peculiar bend which is requisite to keep the eyammer firmly in its place. As the canoes are not of sufficient breadth to float upright the outrigger is used to make up the deficiency. It is always carried to wind-ward and enables the natives to carry a heavy press of sail by applying the requisite weight to counteract the effect of the wind on the sail. This he does by sitting on the eyaccos as far from the canoe as he finds it necessary to preserve the equilibrium of his frail barque and prevent the eyammer from being lifted out of the water. When they are about to sail from one Island to another they use the most efficient means to secure the canoe from accidents. They cover them with a board fitted closely to the top and made secure by strong chords. A space is left in the top where the steers-man can sit securely while he performs the several duties of trimming the sail, steering the canoe and bailing out what water may find its way into it when the sea breaks over, as is frequently the case in rough weather. The outrigger is more carefully secured by double the usual quantity of line, a strong piece of line is made fast to each end of the canoe and from thence to the eyammer to keep it steady. Thus every part is carefully lashed together, but the skill which the adventurous native displays in the management of this fragile piece of machinery can only be appreciated by those who have witnessed it in the hour of danger. At such times while the waves are from eight to ten feet high and rush with great impetuosity undiminished to the shore, the natives, delighted with the opportunity to enjoy their favourite sport of playing on the surf board, may be seen diving and plunging the successive waves in order to gain the outer edge of the reef, to effect this in a heavy surf is very difficult and requires considerable skill. The experienced diver laughing at the efforts of the novice in his art plunges fearlessly in dexterously managing his surf board which he points so as to offer the least possible resistance to the water and bending his body forward allows the waves to pass over him and rushes forward to meet the next. ... board he is seen riding on the fore front of the foaming billow with astonishing rapidity poised on the end of his board and intent upon keeping his equilibrium with his body hanging over the back of the roller, while amid the white curl of the wave he looks like a black speck borne forward with irresistable force till we see him landing high up on the beach with shouts of triumph and the congratulation of his friends in proportion as the feat has been skillfully performed. It is a perilous feat and were he turned over by the catching of his surf board in the reef, which sometimes happens when not skillfully managed as it must hang over the front of this wave while his body hangs over the back of it in exact equilibrium, the forward end by being depressed too low may reach and catch in the reef and inevitably throw him over it with such force as would be likely to kill him. The surf board being made of a light and buoyant kind of wood and fashioned to glide smoothly through the water is admirably adapted to the purpose for which it is used. It is about ten feet long and one foot broad and in the middle about four or six inches thick which is the size usually used by the men but they are made of various sizes to fit the fancy. The swell or greatest thickness being in the centre of the board is gradually lessened to within about six inches of the end then rounded off to a sharp edge. Its width is the same throughout, the edges are rounded and the whole is handsomely proportioned and made as smooth as possible and painted black. They are preserved with the greatest care, as with their crude tools it is an immensity of labour to make one. Tamaamaah the King of all the Islands to windward of Attooi is now (1815) between sixty and seventy years of age. He is rather above the middling stature, remarkably strong and well built, has a good open countenance with a penetrating eye, high cheek bones, and a large mouth. His feats of strength and deeds of valour are spoken of with enthusiasm by his people. He is said to have been superior to most of his companions in all the athletic exercises which were practiced by the young Chiefs, and to have the most retentive memory of any man on the Islands. His natural disposition is mild, but he is inflexibly firm in the administration of government. His power is absolute, his person and every thing appertaining to his dress, or household is sacred. He is head over all, and owner of all property, and can deprive his subjects of their lands, and even life and pleasure, in fine, it is impossible for man to have more absolute power over his fellow creatures than this King has over his subjects. He was remarkable in his prime for great strength and agility, he could throw the spear with greater swiftness and precision than any of his chosen men, and could defend himself with admirable dexterity against several discharged at him in quick succession by his ablest spearsmen, and in all their rude athletic sports of rolling stones, wrestling, boxing, playing on the surf board, and particularly in the management of a small canoe in the surf, he was allowed to be superior to any of the Chiefs, his companions. He was formerly only King of Owhyhee, but successively conquered the other Islands which now compose his dominion. Some of the natives say that he was not the rightful heir to the dominion of Owhyhee, but was only a Chief of the highest order, and that he usurped the power, and destroyed the legitimate heirs. Peabody Museum of Salem, Salem, Massachusetts, 1979. Geoff Cater (2010) : John B. Whitman : Hawaiian Journal, 1813-1815.